Alberto Contador, the two-time Tour de France winner banned for two years for doping, thinks Lance Armstrong has been treated unfairly over cheating claims. "He is being humiliated and lynched, in my opinion. 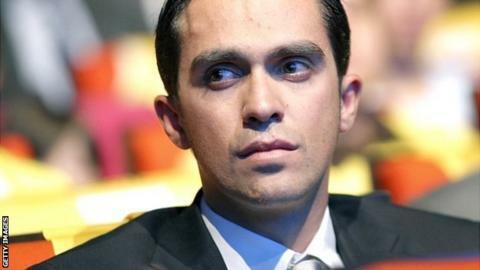 He is being destroyed," said Contador. "At certain times and places Lance is not being treated with any respect." The Usada report called the American a "serial" cheat who led "the most sophisticated, professionalised and successful doping programme that sport has ever seen". Armstrong has kept quiet since Usada's report was published earlier this month. Pat McQuaid, the president of cycling's governing body the UCI, said the Texan "deserves to be forgotten" as he banned Armstrong from the sport for life. But Contador, who rode alongside Armstrong in the Astana team in 2009, said the 41-year-old had left a lasting legacy in the sport and criticised the Usada report's reliance on testimonies from former team-mates and team officials. "Right now people are talking about Lance but there has not been any new test or anything," Contador added. "It's based exclusively on witness statements that could have existed in 2005. "What I do know is that if cycling is popular in the United States it is thanks to him. "If they know over there what the Tour is it's thanks to him, if there are top-level teams and races in his country it's thanks to him." After missing the 2012 race, he won this year's Vuelta a Espana and has been made favourite for the 100th edition of the Tour de France in 2013. Contador is not the only cyclist to have defended Armstrong, with his fellow Spaniard Miguel Indurain refusing to assume his guilt. "Even now I believe in his innocence. He has always respected all the rules," Indurain told Radio Marca in Spain. "I'm a bit surprised. It's strange that this was only based on testimonies." Indurain, who won five Tour de France titles between 1991 and 1995, added: "I think he will come back and appeal and try to show that he played fair for all those years." The UCI's decision to annul Armstrong's results from 1 August 1998 once again makes Indurain the joint record-holder in the Tour, alongside Belgium's Eddy Merckx and Frenchmen Bernard Hinault and Jacques Anquetil. British cyclist Roger Hammond, who rode with Armstrong as part of the Discovery Channel team between 2005 and 2006, called the American a "fantastic" team-mate who "never, ever" offered him performance-enhancing substances. Hammond's compatriot Alex Dowsett, who rode for the US-based Trek-LiveStrong squad, called Armstrong a "legend" for his battle back from cancer. And Olympic gold medallist and USA cycling coach Jamie Staff told BBC South East Today: "He's been kind of a scapegoat really. "He seems to be the one everyone is picking on, probably as he was the most successful."